Looking to quickly identify the critical information in your business documents? GlobalCapture transforms information into business intelligence. 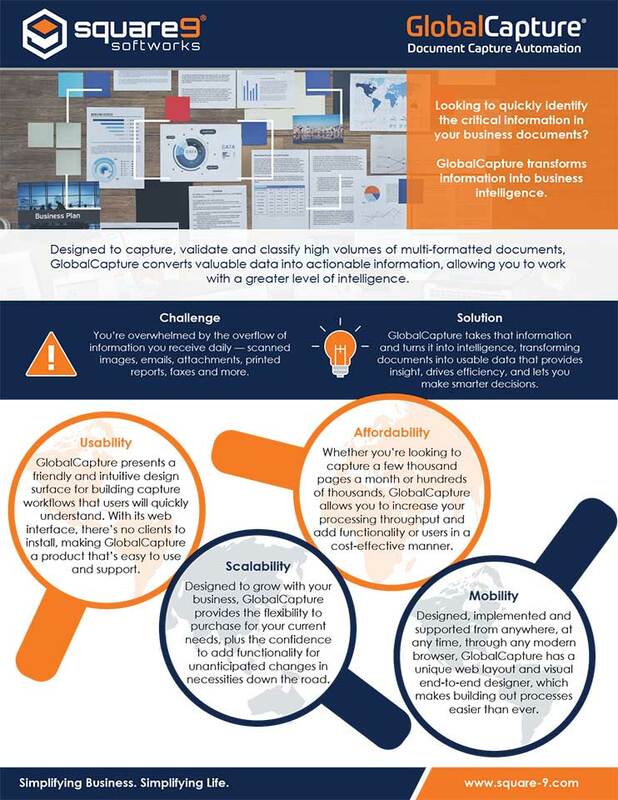 Designed to capture, validate and classify high volumes of multi-formatted documents, GlobalCapture converts valuable data into actionable information, allowing you to work with a greater level of intelligence. GlobalCapture presents a friendly and intuitive design surface for building capture workflows that users will quickly understand. With its web interface, there’s no clients to install, making GlobalCapture a product that’s easy to use and support. Whether you’re looking to capture a few thousand pages a month or hundreds of thousands, GlobalCapture allows you to increase your processing throughput and add functionality or users in a cost-effective manner. Designed to grow with your business, GlobalCapture provides the flexibility to purchase for your current needs, plus the confidence to add functionality for unanticipated changes in necessities down the road. Designed, implemented and supported from anywhere, at any time, through any modern browser, GlobalCapture has a unique web layout and visual end-to-end designer, which makes building out processes easier than ever. Administrators can quickly set up multiple processing engines to handle larger volume workloads, while easily adding and removing threads for varying processing loads. GlobalCapture’s licensing scales based on server processing cores rather than page counts. This means your processes will never shut down unexpectedly at the end of a busy month. You’re not limited to extracting information from scanned images. You can seamlessly capture emails with their attachments and search across everything to find the information you need. High value data mined from your documents can be easily shared across the enterprise and the applications you use most including Accounting, ERP, CRM and BPM platforms. Improve the timeliness and availability of your business information with GlobalCapture.